My father and his longtime friend, Terry, drove out to Hobuck Saturday afternoon and stayed through Sunday evening. Following a few cups of coffee Saturday morning, Karissa and I pitched the two extra tents we brought so we'd be ready to entertain the old farts upon their arrival. After the guys unpacked the car and sorted out their tents, we left camp and hiked down to a little known beach along the straits. 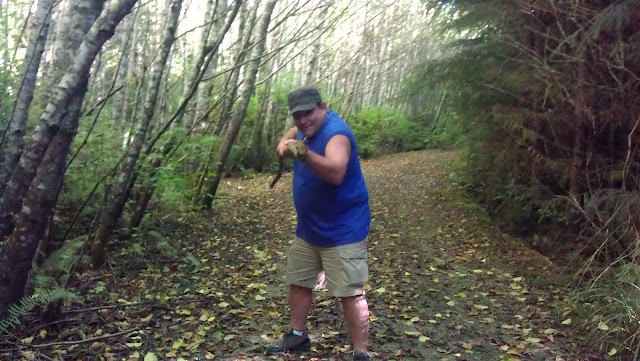 With bear poop aplenty, the Captain was inspired to arm himself with a rather long stick, Anthony Hopkins style. The surf was as flat as a pancake, but the beach is worth the walk. For dinner, Karissa sautéed chicken and broccoli, which she served over brown rice with peanut sauce, while the guys ate fried chicken they purchased at the general store. On Sunday, the four of us hiked to Cape Flattery, picked up some smoked salmon from the Take Home Fish Co. and surfed for a few hours before my father and Terry took off.